For over a century, Bicycle has been making quality playing cards and consistently is ranked as America's most popular brand of playing card. 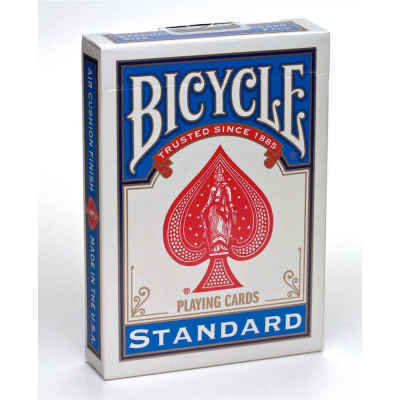 Bicycle brand playing cards have an air-cushion finish and are made with not one but two sheets of paper. Decks are individually cut, not cut in stacks, and the edges are beveled. All these details add up to a card that shuffles nicely, deals out smoothly, has plenty of "snap", and will last! Disclaimer: These playing cards come in two different colors, red and blue. We cannot guarantee which color deck you will receive.